4051 ✉ 156,171 1 Kr. World postal service congress 1924 in of the same value-level mixed franking with 1 Kr. 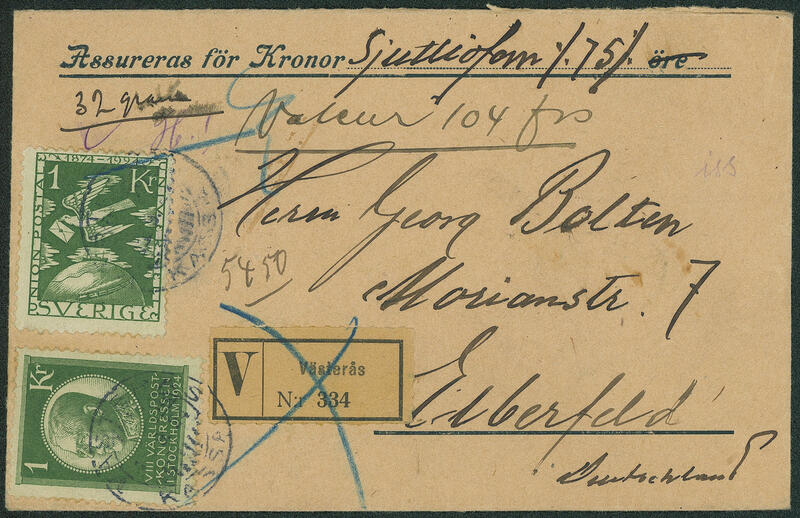 Universal Postal Union 1924 on decorative, commercially used insured letter from \"VÄSTERÄS\" to Germany with arrival postmark \"ELBERFELD 15.9.24. \". Commercially related foreign countries insured letter are general rare, with a such value step same combination a Sweden rarity! 4052 ✉ 158 5 Kr. 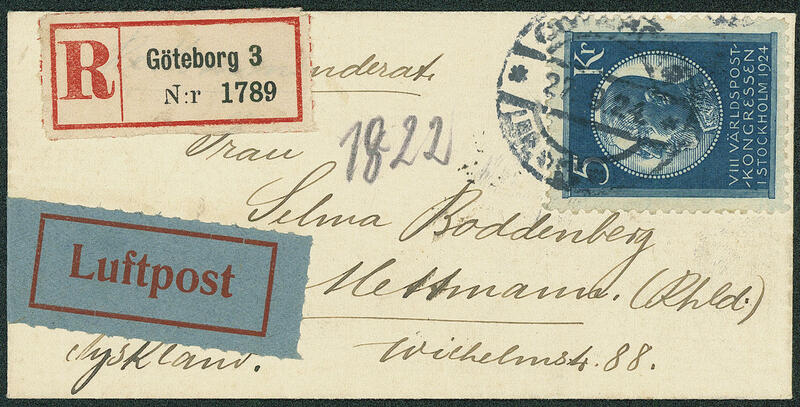 World postal service congress Stockholm 1924, very nice single franking on wonderful small-format register airmail letter from \"Goeteborg 27.9.24\" to Mettmann / Germany with transit and arrival postmarks. These stamp is on cover extraordinarily rare! 4217 ⊙ K9 5 Rp. 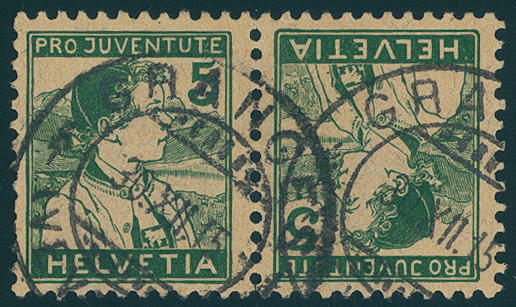 Pro Juventute 1915, horizontal tête-bêche pair, fresh colors and very well perforated, neat cancelled \"ROMANSHORN 22. II. 16. \". Photo expertize Marchand / von der Weid. Michel 1200,- €. 4218 ⊙ K9 5 Rp. Pro Juventute 1915, horizontal tête-bêche pair, fresh colors and very well perforated, neat cancelled \"GRANGES 30. XII. 15. \". Photo expertize \"genuine and immaculate\" Eichele / SBPV. Michel 1200,- €. 4216 ⊙ S3 10-15 Rp. Tell, rare vertical se-tenant, neat cancelled, (SBK no. Z2), photo expertize Eichele. Michel 550,- €. 4067 1a 2 ½ Rp. Black / blue / carmine, the famous \"Bale Dove\", fresh colors, unused without gum, small thin places, of it a reverse hardly noticeably filled, with on all sides untouched to good cut. An attractive copy this in unused condition nearly always missing issue! Photo expertize Eichele. SBK 20000,- Sfr. 4068 ⊙ 1a 2 ½ Rp. Black / blue / carmine, the so-called \"Bale Dove\", wonderful fresh colors and on all sides excellent and wide margins with red two ring cancel \"Basle\". An outstanding quality this large old Switzerland rarity! Photo expertize Rellstab. 4069 ⊙ 1a 2 ½ Rp. Black / blue / carmine, the famous \"Bale Dove\", fresh colors, three sided good margins, above the margin line cut in, thin places, with red two ring cancel \"Basle\". 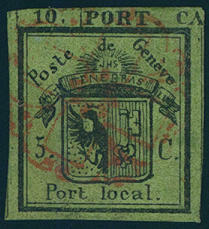 An attractive, not repaired copy this old Switzerland rarity! Photo certificates Moser-Räz, Bossert. SBK 20000,- Sfr. .
4070 ✉ 1a 2 ½ Rp. Red / blue / black, the legendary \"Bale Dove\", wonderful having bright colors and on all sides outstanding with enormous margins, white margined outstanding quality on decorative small-format cover with on of this issue scarce rectangle cancel \"FRANCO\" and additional red two ring cancel \"Basle 3. JANV. 51. 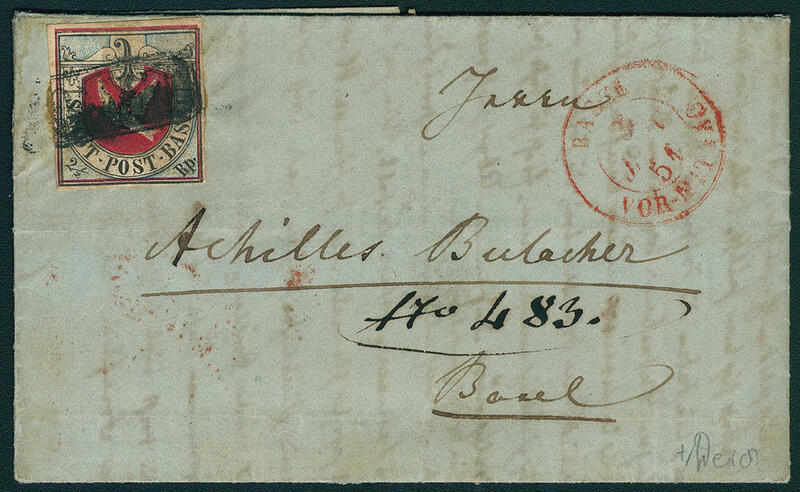 Morning\" to Mr. Bulacher in Basle with on the back red arrival postmark \"Basle 3. JANV. 1851 afternoon\". 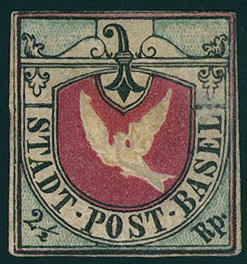 The cover was in Munich written with detailed text and first in Basle of the postal service hand over. 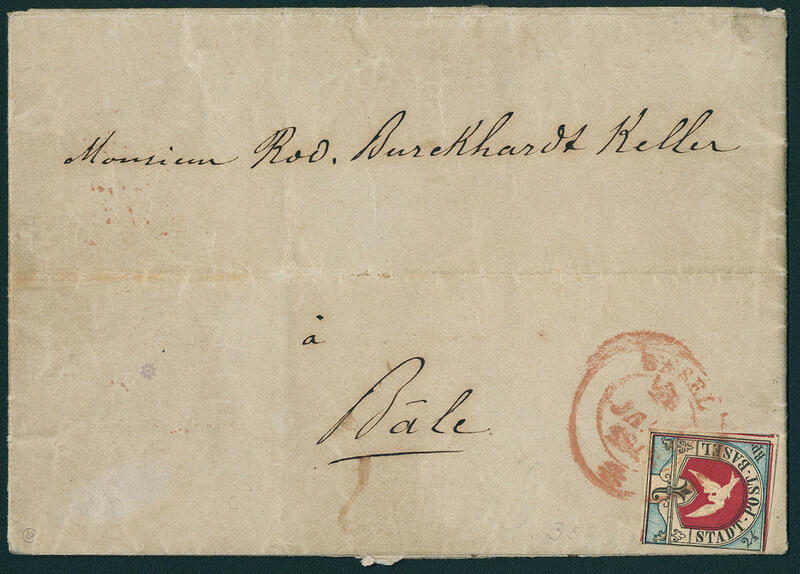 A very rare forwarded-letter, the be additional through the outstanding quality the Bale auszeichnet. Already lots used examples in this cut quality become almost never offered. 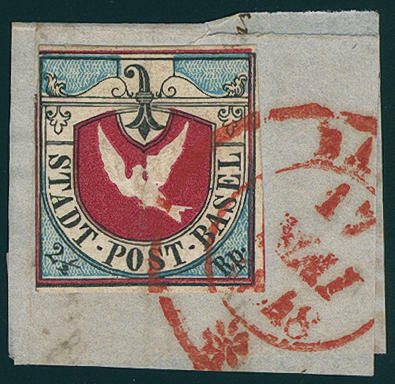 A so interesting cover places a significant old Switzerland rarity dar! Photo expertize \"genuine and faultless\" Marchand / SBPV. 4071 ∆ 1b 2 ½ Rp. Black / bright blue / carmine, the legendary \"Bale Dove\", 1. Edition, illuminating fresh colors, left above minimal cut into, otherwise excellent margins, crease, on decorative letter piece with clear red two ring cancel \"Basle 17. May. 48. \" with very fine distinct relief. An extraordinarily attractive copy! Photo expertize Alain von der Weid. SBK 23000,- Sfr. 4072 ✉ 1b 2 ½ Rp. 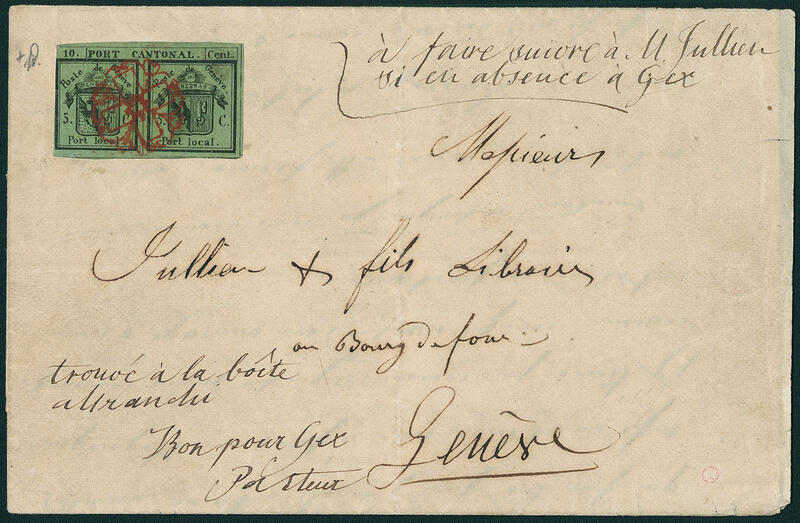 Black / bright blue / carmine, the legendary \"Bale Dove\", fresh colors, two-sided white margined, left cut into, as well left lower margin line touched, on extremely scarce \"FORWARDED / CIRCULAR folded letter\" from \"MULHOUSE 7.1.1848\", in Basle of the postal service hand over with red two ring cancel \"Basle 13. JANV. 1848. 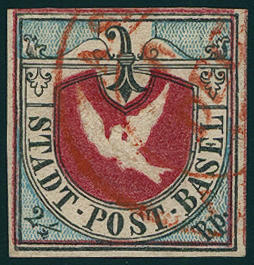 \" and in the local usage transported with arrival postmark on the back \"Basle 13. JANV. 1848 to Noon\". 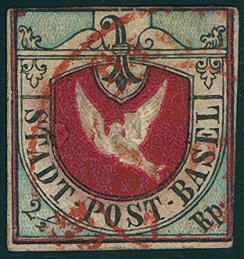 Covers with the Bale Dove are general rare and to class among the rarities the Swiss philately. 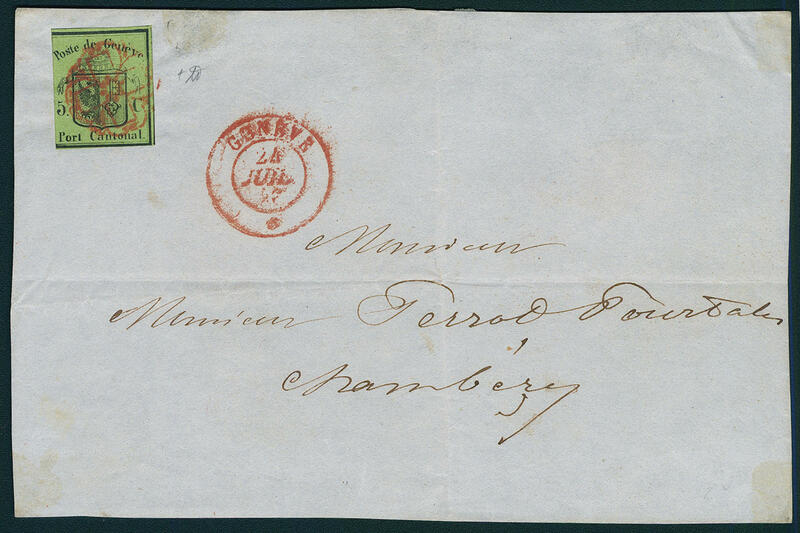 There are however very few Forwarded covers have become known, the to the postage saving first in Basle mailed were. A postal history top rarity the classic philately! Photo certificates Alain von der Weid / SBPV, Eichele / SBPV. SBK 50000,- Sfr. 4232 11z 1 Fr. On painted granite paper with ribbed gum, in perfect condition mint never hinged Michel 320,- €. 4220 ⊙ 2I 2 C. Dark olive / dark orange red 1911, faultless corner margin block of twelve top left with strong to the top shifted control numbers 1-16, neat cancelled a particularly beautiful unit this distinctive variety! 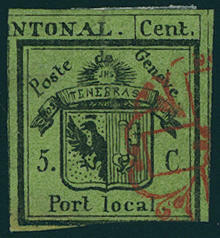 4054 ⊙ 1 5 C. / 5 C. Black / yellow green, the famous \"Double Geneva\", wonderful fresh colors, left above very close margin, otherwise on all sides wonderful with wide margins, left half small tears outside of the stamp design and some creasely, as far as in perfect condition with especially nice centric mounted red Genevan rosette. A very attractive copy this large old Switzerland rarity, the in almost all collections is absent! Photo expertize Alain von der Weid / SBPV. SBK 55000.- Sfr. 4055 ⊙ 1 5 5 Cts. 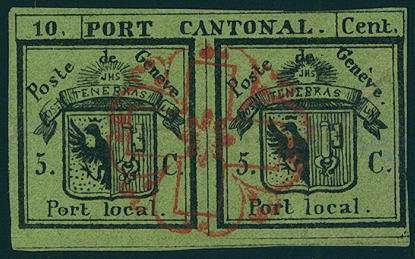 Black on yellow green paper, the so-called \"Double Geneva\", wonderful fresh colors, on all sides good to wide margins, only in the middle corrected, with especially nice centered and clear mounted red Genevan rosette. An extremely effective example of this great European rarity! Photo expertize Berra-Gautschy. SBK 55000,- Sfr. 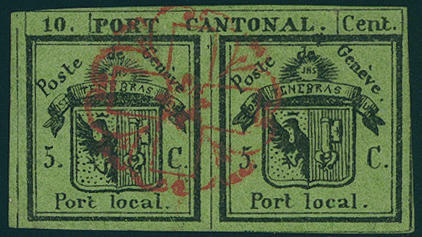 4056 ✉ 1 5 C. / 5 C. Black on yellowish green, the famous \"Double Geneva\", wonderful fresh colors, three sided with wide margins, left to the margin line cut, with especially nice clear centered red Genevan rosette on beautiful small-format cover with handwritten notation \"TROUVE A LA BOITE AFFRANCHI BON POUR GEX FACTEUR\" and an additional handwritten notation \"A FAIRE SUIVRE A M JULLIEN Sowed ABSCENCE A GEX\" at the well-known address Jullien et File in Geneva. 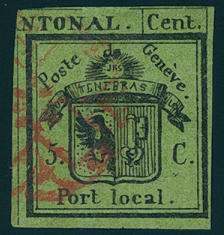 This is the only known cover with a Double Geneva, which in the mailbox (Boite) found was. Are so nice covers of the Double Geneva already in normal form extremely rare, so it concerns an herewith about a postal history great rarity the classic Switzerland philately. Photo expertize from the Weid. 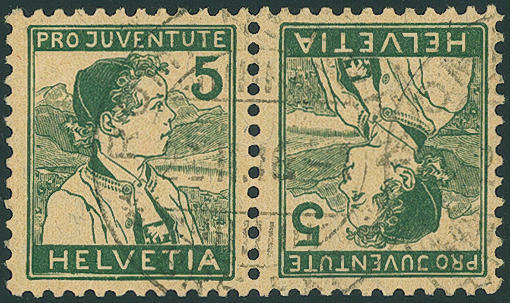 4057 ⊙ 1HL 5 C. Black on yellow green, left half of the Double Geneva, with centered mounted red Genevan rosette, small faults, an impressive copy this old Switzerland rarity. Photo expertize Alain von der Weid / SBPV. SBK 12000,- Sfr. 4058 ⊙ 1HR 5 C. Black on yellow green, right half of the Double Geneva, fresh colors, above small rubbed spot, otherwise good margins and in perfect condition with clean mounted red Genevan rosette. 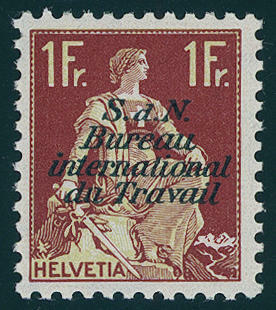 An attractive copy this sought-after Switzerland rarity! Expertized Moser, photo expertize Berra-Gautschy International Association for Philatelie Experts. SBK 12000,- Sfr. 4059 ⊙ 1HR 5 C. Black on yellow green, the right half the \"Double Geneva\", fresh colors, at the bottom cut into, as well left been glued tear, otherwise good margins in good condition with neat red Genevan rosette. Photo expertize Marchand / von der Weid. SBK 12000,- Sfr. 4060 ∆ 3 5 C. Black on yellow green, so-called \"small eagle\" wonderful fresh colors, three sided having full to wide margins, left cut into, on decorative front of cover with red Genevan rosette and additional red two ring cancel \"GENEVE 24. JUIL. 47. \" to Chambesy. Photo expertize Alain von der Weid / SBPV.